Increased insights to the consumption of resources. Ongoing optimisation of budgeting and planning. Automatic calculation of flextime and leave, that will always be visible to the employee. Automatic calculation of earned and held vacation (including the new Holiday act). Live access to work time reports. Internal project management with planning, time registration and follow-ups. No more Excel spreadsheets. TimeGuru handles it all. Easy registration and billing of time, mileage and expenses on projects and customers. Handle billable time separately from work time. Detailed documentation of time consumption. Automatic integration of invoices to most financial systems. Reporting of revenue and earnings from customers, projects, departments and activities, etc. Planned versus actual consumption for evaluation and ongoing optimisation. If you are not already a TimeGuru user, you can register here. A set-up guide will help you adapt the solution to your company and you can easily invite your colleagues. You can register as a new user or log in with a Office 365, Google, Facebook or LinkedIn user. Please contact us if you need AD, LDAP or any other integration. You can easily register time, vacation and other absence via the worksheet. 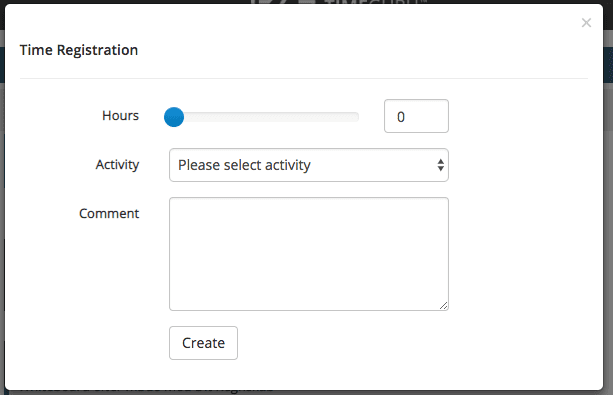 When you register your time, you can choose if the hours belong to a specific activity, customer or project. You can also write a comment, that typically will be details about the work. In the system configuration, you can set up the worksheet to fit your company’s needs. You can choose to show/hide boxes and you can choose if the boxes are mandatory. This makes the system even more user-friendly, as you will only see the inputs you choose. You can always activate more functionality without loosing existing data. Full weekly overview, both on phone, tablet and PC. You can choose a simple or more advanced worksheet, depending on your company’s needs. Time saving copy/paste of all earlier registration. Flextime balance is always fully updated and visible to the employees. Booked public holidays is incorporated automatically in the flex balance (no need to register separate). Time tracking and optional pricing on activities, projects and customers. Optional separation of work time and billable time. Below you can see an example of both simple and advanced time registration. Worksheet is set up for internal registration and project and costumer registration. Worksheets is set up for internal time management of work, absence and vacation. Registration of mileage is easily handled via the worksheet. The system automatically fills out all known information and calculates the distance. Therefore, you often only have to select a customer and if the trip was a return trip, to make a mileage registration. If you visit the same address regularly, you can use the copy/paste feature, to register your mileage in no time. Expenses is often used for paying out of private expenses or for passing on to billing of time/material. To register an expense, you take a picture of the receipt and choose if the expense will be assigned to a customer or a project. You can write a comment as well; the accountant often needs to know a little more about the expense (for example who you ate with if it’s a restaurant bill). 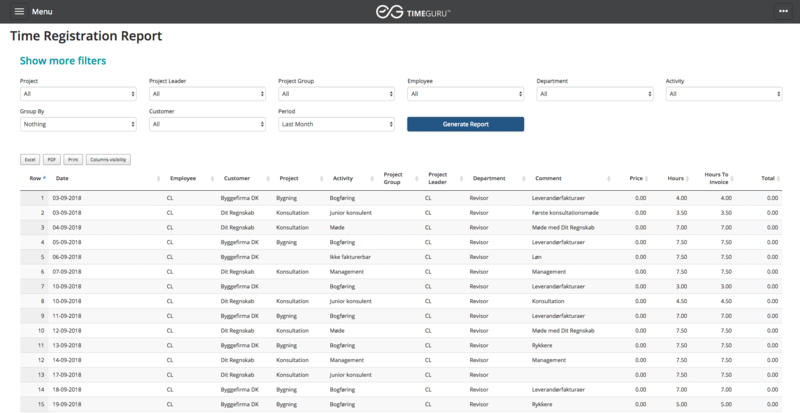 When you register your TimeGuru system, a step-by-step guide will help you configure your system. If you wish to make changes later, you can do this in system settings, without losing existing work. The settings also has a section with configuration of the worksheet (see screenshot below). In this section, you choose if your company needs to register on costumers, projects, activities or simply write a comment. Furthermore, you can select if inputs are mandatory. You can configure your worksheet in system settings. For internal registration of time, vacation and absence, you will typically activate “Activities” and “Comments” where the selection of activities is mandatory. 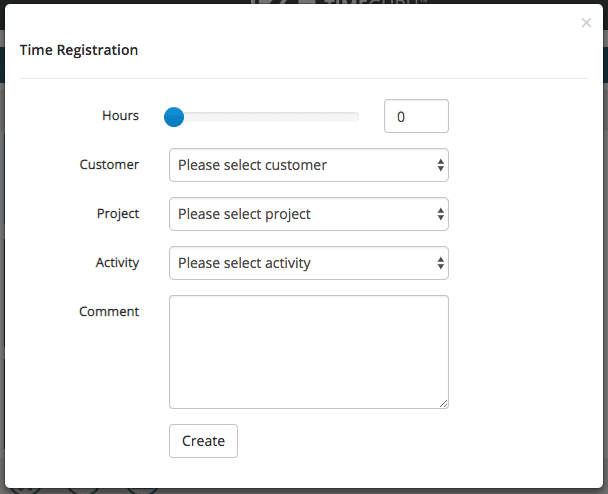 If the registrations will be used for billing, you can activate “customers” and optional “projects”, where the selection of customers will be mandatory. If there is a need to register using internal projects or customer projects, you can activate the selection of “projects” as well. This box will typically be optional. Projects: If there is a need for project/task specific prices, you can attach a cost element to the project. Employees: This is a very simple method, typically for internal usage of cost per employee group. Resources (default for planning): You can attach a cost element to every resource in the planning-module. This way you can compare planning with actuals across customers, departments, activities and employees etc. All prices in TimeGuru are managed using price elements, which is a huge advantage whenever you need to regulate prices. All you must do, is add a new line to the cost element with cost price, sales price and valid from date. Afterwards, the system will automatically use the new cost and sales prices from the chosen date. All registrations can be viewed in reports and exported to Excel or PDF, if necessary. TimeGuru reporting is extremely flexible. You can choose filters, columns, groupings and sorting, and the system will remember your settings. Below is an example of a time registration report. All registrations can be viewed in flexible reports with optional filtering, grouping, sorting and period selection. The system will remember your settings, so the report is always readily at hand. This wraps up the walk through of time, expense and mileage registration. On the next page you can read about the setup and usage of flextime, vacation and leave in TimeGuru.